The Montreal Melon’s roots have been traced to varieties brought to Canada by French settlers in the 17th century. During its heyday in the early 20th century it was known as the Queen of Melons, prized for its unique sweet and spicy flavour with tones of nutmeg. The Montreal Melon is extremely large in size with thin dark green skin that is easily bruised. It requires fairly labour-intensive farming to ensure its maximum sweetness and flavour and its generous size also makes transport fairly costly. These attributes make it a difficult melon for mass production and led to its disappearance in commercial production. In fact, by 1990 the melon seemed to have become as extinct as the French varietals that were their ancestors. Local interest by members of Eco-Initiative, a Montreal based community organization, about the agricultural heritage of the area rekindled the melon. Seeds were discovered in Iowa at an agricultural research station. 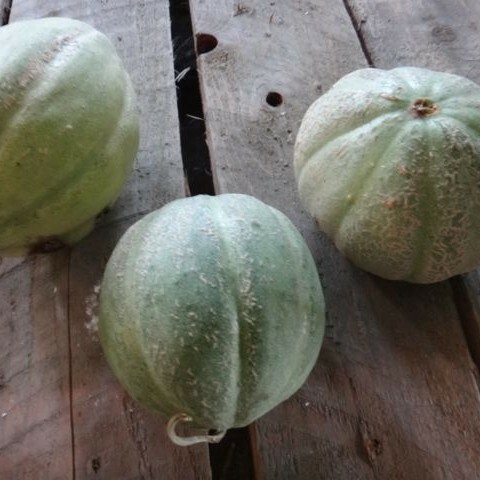 With the help of local organic farmers and the Eco-Initiative community garden, this unique melon has been resurrected. It is believed that the Montreal melon is best adapted to the rich soil and slope on which the Montreal suburbs are built. Eco-Initiative sponsors an urban community garden in the same area that used to be the old orchards that fed Montreal residents until the 1950’s. They now have a Cantaloupe Garden specifically created to honour and grow the Montreal Melon. Local organic farmers have also begun growing the melon, but it is still considered at risk and there is not extensive production of this delicious melon.